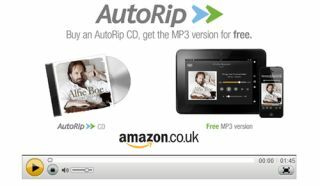 Amazon AutoRip launches in the UK offering free Cloud Player MP3s | What Hi-Fi? Amazon is today launching its AutoRip music service in the UK which means customers will receive free MP3 versions 'in the cloud' of CDs and vinyl they've bought from Amazon's UK website. When customers buy AutoRip CDs and vinyl, the MP3 versions are automatically added to their iCloud Player libraries where they are available, free of charge, for immediate playback or download. More than 350,000 albums, including titles from all the major record companies, are availaible for AutoRip and Amazon says it is adding new titles all the time – just look for the AutoRip logo. "What would you say if you bought CDs, vinyl or even cassettes from a company 14 years ago, and then 14 years later that company licensed the rights from the record cmpanies to give you MP3 versions of those albums," says Jeff Bezos, Amazon.com founder and CEO. All AutoRip MP3s are provided at 256Kbps and are do not count against customers' Cloud Player storage limits. Recent albums available with AutoRip include Adele's 21, Our Version of Events by Emile Sandé, Babel by Mumford & Sons, Only By The Night by Kings of Leon, London Calling by The Clash and Thriller by Michael Jackson. Prices start from £4.99. The Amazon Cloud Player service puts Amazon up against similar services from Apple and Google: Apple iTunes Match and Google Play All Access. Amazon Cloud Player Free, is of course free, or you can pay £21.99 for Cloud Player Premium for storage of up to "250,000 songs", the same price as iTunes Match. Google's service, which looks to combine a Spotify-style streaming service and cloud storage access to your music, has yet to launch in the UK.